Located just 120 kms from Mumbai, Pune is among the top 10 most important cities of India. After the IT revolution in India, many companies shifted their bases to this city. As a result, the population of the city has increased in the past decade. This led to an increase in the demand for fitness and lifestyle products. Considering this as a good opportunity, many retail outlets are now catering to the needs of the sports and fitness enthusiasts in the city. 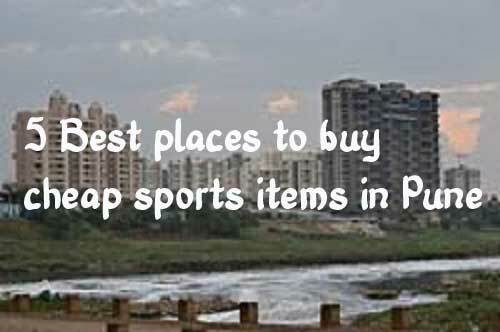 Many of these stores offers sports goods/equipment at the cheap/best price in Pune. This is a popular sports outlet located in Tilak road. But it has branches in Nagar road, Pimpri, Akurdi and Satara. If you are staying in Pune, then the outlets in Tilak road and Nagar road will be nearer. One can reach to this outlet via public transport like buses or auto or through personal vehicle. Outlets in Pimpri, Akurdi and Satara are out of the city. You can find all kinds of brands in the outlet. Nike, Adidas,Fila etc. all popular brands are present in the shop. Occasionally, they offer discounts on specific products. You can get products related to almost all kinds of sports be it Cricket, cycling, Hockey etc. Decathlon is one of the largest sports retail outlet in India with around 60 branches in different cities. In Pune they have 2 outlets, one in Wagholi and other one in Amanora mall which is in Hadapsar. You can reach these places through personal vehicle or through bus/auto. You can get all kinds of sports goods in Decathlon. There are seasonal discounts on specific products. You can shop during those times to get the best deals. Brand-wise, you can get to see all popular brands in the outlet. Decathlon can be regarded as no.1 sports outlet in India, mainly because of its passion towards the sports. All the staff working in Decathlon are passionate about sports. Century sports is located near Deccan Gymkhana. It is easy to reach their through public transport. Lots of buses pass through this route. You can even reach via auto. One can get equipment’s related to Badminton, Basketball, Football, cycling and various other different sports in this outlet. There are limited number of brands available in the shop but goods are available at attractive discounts. One can visit the shop’s website to get more information regarding the products and discounts offered. They even have an e commerce portal for selling goods. In Deccan Gymkhana, you will find another outlet i.e. Champion sports which is very much popular. One can get almost everything related to sports in this shop. The shop has goods of all reputed brands. It is sensible to reach here by public transport as you might face parking issues if you go by personal vehicle. Prices of goods are reasonable in this shop. Total sports in Phoenix market city, Vimannagar road is a complete shop. It has all kinds of sports goods required by sports enthusiasts. You can also find all kinds of brands in the outlet. Total sports has good presence in Mumbai and is a growing brand. Price wise, there is no scope for negotiation as all the goods are sold at MRP. Next post: Can virat kohli break sachin’s record?